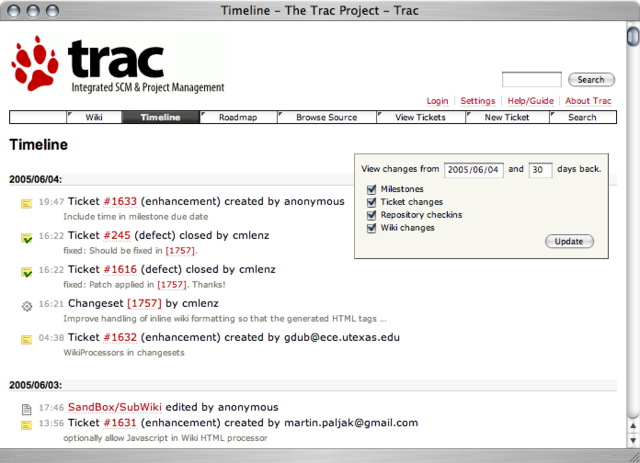 Trac is an enhanced wiki and issue tracking system for software development projects. Trac uses a minimalistic approach to web-based software project management.The project’s mission is to help developers write great software while staying out of the way. Trac should impose as little as possible on a team’s established development process and policies. It provides an interface to Subversion, an integrated Wiki and convenient reporting facilities. Trac allows wiki markup in issue descriptions and commit messages, creating links and seamless references between bugs, tasks, changesets, files and wiki pages. A timeline shows all project events in order, making the acquisition of an overview of the project and tracking progress very easy. The BitNami Trac Stack native installers were packaged using BitRock's cross platform installer tool. Top 4 Download periodically updates software information of BitNami Trac Stack for Linux 1.2.3-8 full version from the publisher, but some information may be slightly out-of-date. Using warez version, crack, warez passwords, patches, serial numbers, registration codes, key generator, pirate key, keymaker or keygen for BitNami Trac Stack for Linux 1.2.3-8 license key is illegal and prevent future development of BitNami Trac Stack for Linux 1.2.3-8. Download links are directly from our mirrors or publisher's website, BitNami Trac Stack for Linux 1.2.3-8 torrent files or shared files from free file sharing and free upload services, including Rapidshare, HellShare, HotFile, FileServe, MegaUpload, YouSendIt, SendSpace, DepositFiles, Letitbit, MailBigFile, DropSend, MediaMax, LeapFile, zUpload, MyOtherDrive, DivShare or MediaFire, are not allowed! Your computer will be at risk getting infected with spyware, adware, viruses, worms, trojan horses, dialers, etc while you are searching and browsing these illegal sites which distribute a so called keygen, key generator, pirate key, serial number, warez full version or crack for BitNami Trac Stack for Linux 1.2.3-8 download. These infections might corrupt your computer installation or breach your privacy. A keygen or key generator might contain a trojan horse opening a backdoor on your computer. Hackers can use this backdoor to take control of your computer, copy data from your computer or to use your computer to distribute viruses and spam to other people.